The Association for Anthropology and Gerontology, and the Life Course (AAGE) was established in 1978 as a multidisciplinary group dedicated to the exploration and understanding of aging within and across the diversity of human cultures. Our perspective is holistic, comparative, and international. Our members come from a variety of academic and applied fields, including the social and biological sciences, nursing, medicine, policy studies, social work, and service provision. 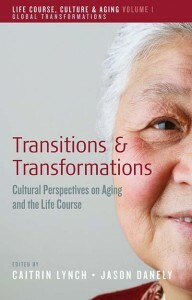 In alliance with the AAA Interest Group on Aging and the Life Course and Berghahn Books, we publish the book series: Aging, Culture and the Life Course: Global Transformations (the first volume pictured left).The fourth volume in the series will be on caring and migration (due May 2018). We also publish the peer-reviewed open-access digital journal Anthropology & Aging (below right). Since launching its current platform in 2014, Anthropology& Aging has earned a seal from the Directory of Open Access Journals (DOAJ). AAGE is present at a number of yearly conferences in addition to holding its own biennial conference. Click here for more about conferences. AAGE sponsors the Margaret Clark Award to recognize excellent student scholarship. Two prizes are awarded annually for best undergraduate and graduate student papers on aging and anthropology. You can also see a list of all past Margaret Clark Awardees here. Students may also apply for the Jacob Climo Award to support student conference travel. Follow us on Facebook and Twitter join the conversation there. Members also participate in open forum discussion boards about jobs, organizing panels, or current events topics. If there’s a problem with the website, you can contact the administrator here: admin@anthropologyandgerontology.com.